Today as I was making my dogs their dinner, I got a little teary eyed. You see, this time of year is hard for me. 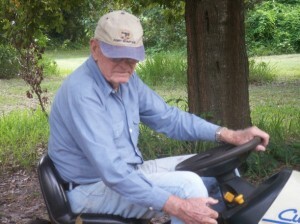 My grandfather, Pappy, died a year ago tomorrow. He was my best friend and my life long companion. He taught me how to garden, how to take care of our orange trees, how to cherish family and he passed to me his love of all animals. We raised cows when I was a child, and every evening, I would ride in the back of his truck filled with hay and old, rotten oranges and feed the cows. I will never forget that as long as I live. And it seems like yesterday I was in that truck. The older I get, time slips by so fast. It’s true..it happens. 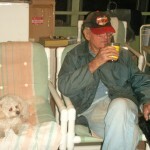 Like I said, Pappy passed to me his love of animals. When I was a toddler, he had a dog named Otis. Otis was a coonhound mix and the runt of the litter. He followed Pappy everywhere…except when he was out hunting. That proved to be a mistake, as an alligator in the back pond attacked him. Otis lost one of his legs. Numerous surgeries and worrisome days followed. I can’t remember Otis that well, but I do remember him pulling me around in a red wagon…with three legs. Pappy loved that dog. And that is where MY love of dogs started. So today, as I was making the dogs dinner, I wondered what Pappy would think of this new business of mine, Your Dog’s Diner. I can hear him saying as he would look at my bags of Mutt Soup and Mutt Meatballs, “What the heck is that?” Then he would laugh. And then I bet he would give a bag to Granny and tell her to cook it up. She would look at him and say, “You cook it”. Then they would have a glass of Merlot and Diet Coke on their front porch. My mind wanders thinking about the what ifs. But I do know this. 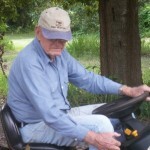 Pappy, I sure do miss you. You have been gone a year, and it just gets harder. But I will make you proud of me. I will. And your dog Cuddles is still here, with Granny. We make her Mutt Soup. And she loves it.